My thoughts on the 2016 presidential election — in video form, of course. 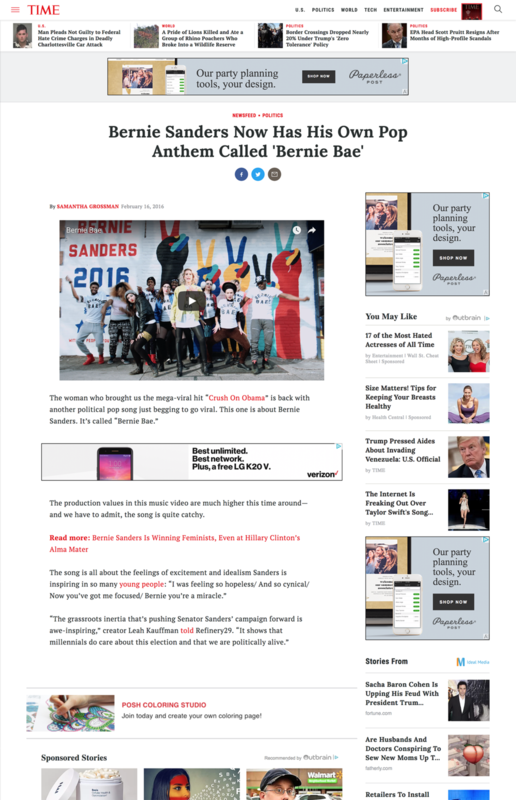 As a fervent supporter of Bernie Sanders, I wanted to further the grassroots inertia pushing Senator Sanders' campaign forward with the help of a team of Voguers, set designers, and more who all passionately #FeelTheBern. Featuring lyrical gems like "Talk Bernie to me" and "You're much more than a human Birkenstock," the song succinctly explains why many feel inspired by the Vermont senator: "I was feeling so hopeless/ And so cynical/ Now you've got me focused/ Bernie you're a miracle." Created by Leah Kauffman. Music & Lyrics by Leah Kauffman and Jeffrey Fry. Filmed and edited by Dan King Photography and Jon Chicot. Associate Produced by Chris Barrett. Special thanks to: Choreographers Kemar Jewel and assistant choreographers Dalyla Mizani, Hank Watts, Harun Jones, and Kareem Mobley.